For those on the go with little time to spare, I don’t think this recipe can get any simpler. But don’t let this quick recipe fool you! It may take no time and require few ingredients but it is filled with flavor!! Mix together apricot and red pepper flakes in a bowl. You can put in as much red peppers flakes as you like depending on your tolerance for spicy flavors. Line chicken breast on a broiler pan and spoon out apricot mixture onto each breast. Option about half way through I add more apricot glaze to the chicken while it’s cooking for extra flavor. 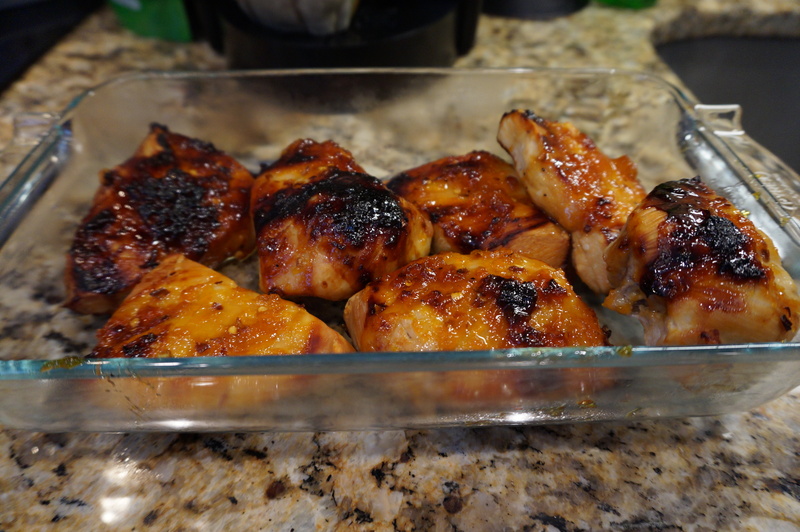 I personally like my chicken on the crispier side, you don’t have to let your glaze get this dark. Just because the top layer is crispy doesn’t mean you won’t bite into juicy flavor-fulness. *serves nicely with grilled asparagus, brown rice, roasted cauliflower, baked potatoes, etc.